I love lemons! I love them in cooking, in baking, on tea towels, in my kitchen décor…I just love them, for their sunny yellow rinds and their fresh, tart flavor. Lemon squares are, to me, a classic American dessert, a staple at bake sales and church picnics. 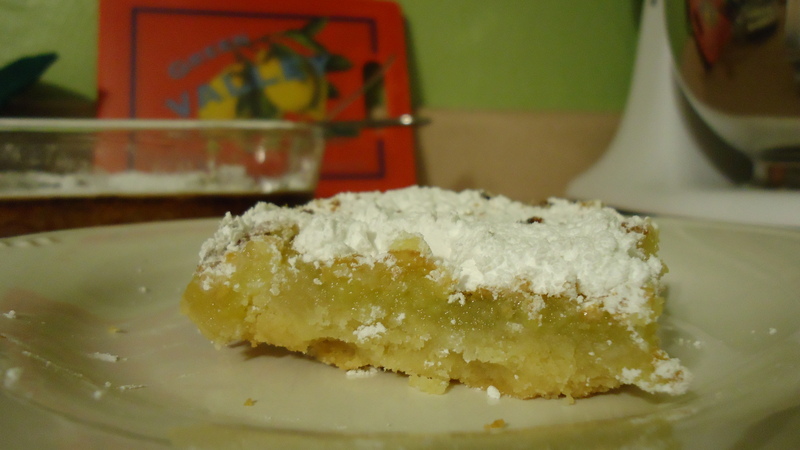 Every woman in American probably has a recipe for lemon squares somewhere in her arsenal. I know I have several, and yet, until today, I’d never made them from scratch. In a mixing bowl, combine flour, butter, and powdered sugar and mix on low speed until small, pea-sized crumbs form. Press into bottom of an 8x8x2 baking dish. Bake for 20 minutes; meanwhile, prepare filling. Beat granulated sugar, lemon zest, lemon juice, baking powder, salt, and eggs until pale yellow and somewhat fluffy (but not meringue-like fluffy), about 3-5 minutes. Pour over hot crust and bake for 25 minutes, until no indentation remains when touched lightly in center.